This pattern looks way more complicated than it actually is! Once you know the stitch sequence, it works up really quickly! I think the end result looks really lovely. If you use three colors like I did, you don’t even have to cut the yarn at each end when you turn your work! I carried my yarn up each side as I went, since I knew I would be adding a border at the end which would cover up those lines. shows you how to change colors for each row by finishing the last stitch of the previous row with the new color. This is the best video tutorial I have found for how to do this. 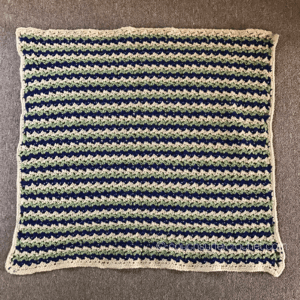 The finished blanket is approximately 36″ square with border. I used an I/9 (5.5 mm) hook, and the yarn I chose is standard worsted-weight yarn. R4-55: Repeat Rows 2 and 3, alternating through Colors A, B, and C. I ended with Color A to blend in with the border. Fasten off and weave in ends. Border: With Color of choice (A shown), join to 1st st of last round with a sl st. Ch 1, sc in 1st st, sc 3 in each loop across. Ch 2, sc evenly down side, being sure to cover floats. Ch 2, sc across foundation chain, ch 2, sc evenly up other side, sc 2. Join to first sc with a sl st and fasten off. 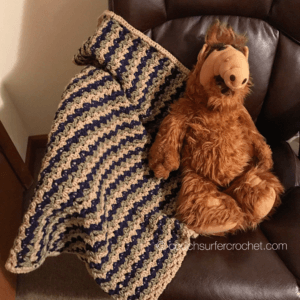 This cute little blanket is even ALF approved! I sure do hope that little boy loves this blanket as much as we are gonna love him! 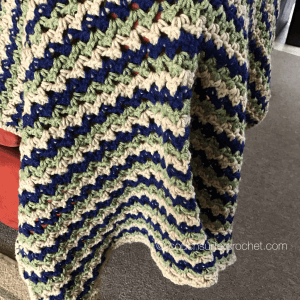 If you want to try a different baby blanket, check out this free pattern. I know it will look amazing in whichever colors you choose! If you want to share your finished blanket, tag me on Instagram (@couchsurfercrochet). 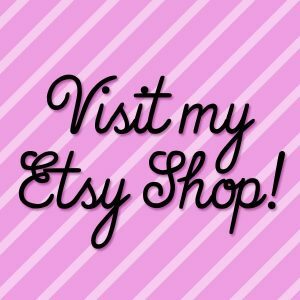 Or you can join the Couch Surfer Crocheters Facebook group and share there! 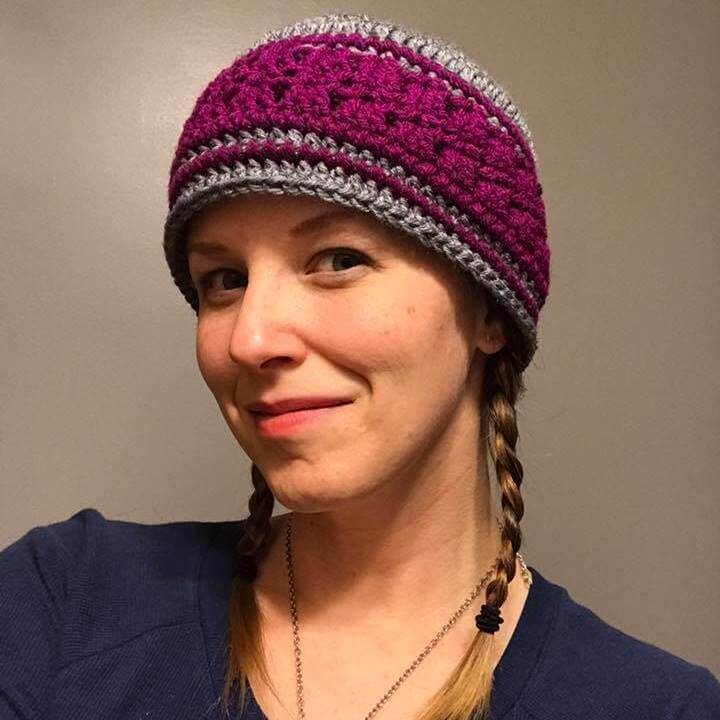 This pattern is available as a free Ravelry download. Click here to download now.